There are many CPU architectures in current embedded devices. MIPS is also a popular architecture for embedded systems. Here I'm going to play with a MIPS based AR7240 SoC as my development environment which has a MIPS 24Kc CPU . I'm using a TPLINK-WR740N router as my development board as I don't have any other MIPS development boards. It runs OpenWRT Linux for MIPS (this is not the stock version,I have installed it). So I won't be going to much lower level and I will play at the Linux level like using Linux on Rarspberry PI. For testing I just wanted to blink a LED which is connected to the GPIO0 using a shell script. I found the GPIO mappings from the OpenWRT wiki. The LEDs are already controlled by a module by default and I had to unload it using "rmmod leds_gpio" command. If you are new to Linux, here you can find about Linux kernal modules. I found a great tutorial on controlling GPIOs in any Linux system and I coded a simple shell script to blink the LED connected to GPIO0 in 1 second intervals. Raspberry PI wiki also has a good tutorial on this. 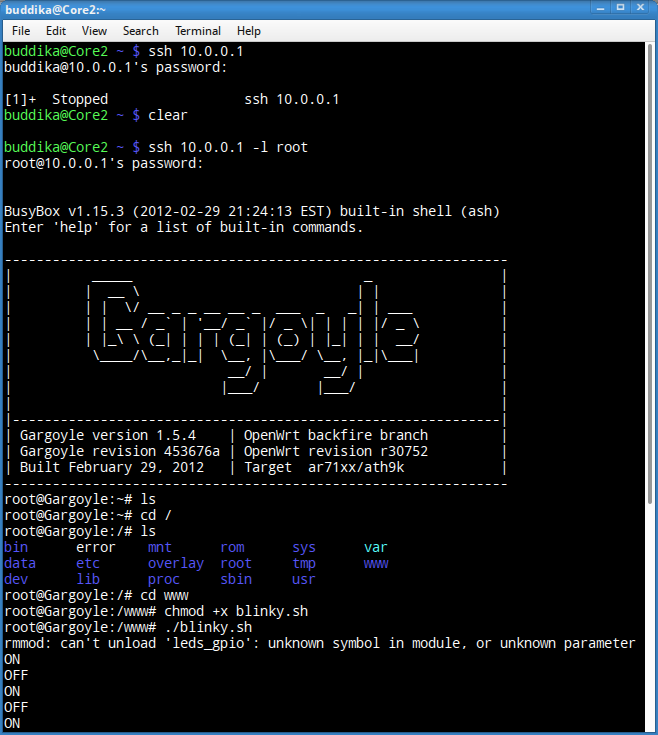 I logged into the router with "ssh 10.0.0.1 -l root" and made a shell script called blinky.sh with above code using echo command (echo "the above code" > blinky.sh). You can create the blinky.sh file on PC and upload it to router using a SFTP client too. Then I made it executable with "chmod +x blinky.sh". Finally I run the script using "./blinky.sh" and it was a success.